The scythed chariot is potentially one of the most lethal battlefield weapons and has ancient origins, though Leonardo noted their propensity to damage friend as readily as foe. The drawing for these war machines dates from his first years in Milan. In Renaissance times, war was the order of the day and war machines were at the centre of interest not only for their practical use but also from a cultural point of view, with the rediscovery of inventions from classical times. In Leonardo's notebooks there is an array of war machines which includes a tank to be propelled by two men powering crank shafts. Although the drawing itself looks quite finished, the mechanics were apparently not fully developed because, if built as drawn, the tank, with a lot of effort, might be made to rotate on the spot, but would never progress in a forward direction. In a BBC documentary, a military team built the machine and found it not working, until they changed only one of the gears. 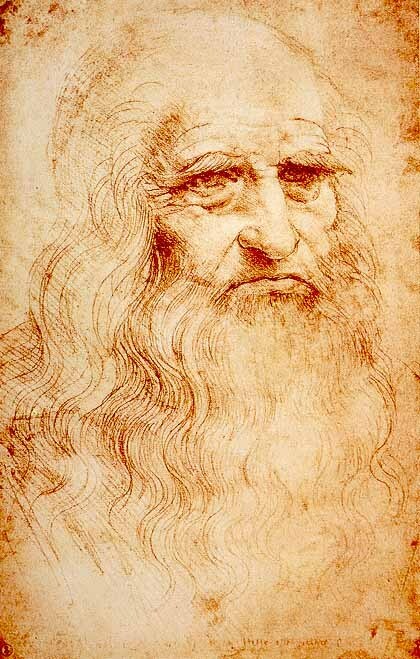 It is believed that Da Vinci deliberately left this error in the design, in order to prevent it from being put to practice by unauthorized people. Another machine, propelled by horses with a pillion rider, carries in front of it four scythes mounted on a revolving gear, turned by a shaft driven by the wheels of a cart behind the horses. Leonardo's notebooks also show cannons which he claimed "to hurl small stones like a storm with the smoke of these causing great terror to the enemy, and great loss and confusion." He also designed an enormous crossbow. Following his detailed drawing, one was constructed by the British Army, but could not be made to fire successfully. Leonardo was the first to sketch the wheel-lock musket c. 1500 AD (the precedent of the flintlock musket which first appeared in Europe by 1547), although the Chinese of the earlier 14th century had used a flintlock 'steel wheel' in order to detonate land mines.